BRYAN EATON/Staff photo. 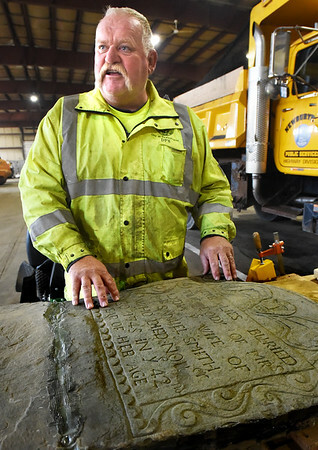 Newburyport Department of Public Services foreman Alan Frost with the gravestone of Lydia Smith who died in 1745 and which he restored. Pieces of the stone were found on land in Pepperell and the owners contacted officials in Newburyport. Frost found the other part of the stone at Old Hill Burying Ground on Greenleaf Street in Newburyport and plans to reinstall the piece on the 272nd anniversary of the woman's death on November 30.